Big data presents a tremendous business opportunity in customer behavior analytics for the companies that are best equipped, ready, and able to transform raw data into insightful information. The first step in getting to improved customer behavior analytics is data preparation. The process of preparing data and transforming large and diverse datasets into useful information has long posed a number of very complex problems for companies’ analytics teams and IT staffs. Forrester reports that data analysts will spend up to 80% of their time preparing data for analysis. 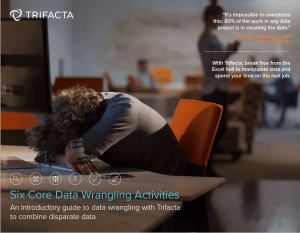 Uncover more about how Trifacta Wrangler can help your business find new value and insights in customer behavior analytics. Download our eBook introduction to data wrangling, Six Core Data Wrangling Activities.